Halloween is just around the corner, the countdown has begun, but how safe will you be this Halloween? Many readers will probably be aware of the dental dangers posed by all that trick or treat Halloween candy, while others are more concerned about the resulting repercussions if their candy bowls run dry before the final trick or treaters have knocked at their door. But how bad can a trick be? This year things are different. The threat is more real and it is no longer restricted to Halloween night. A new concept has hit the streets. It’s called the fright mob and everyone and anyone is fair game. What’s a fright mob? You might well ask. 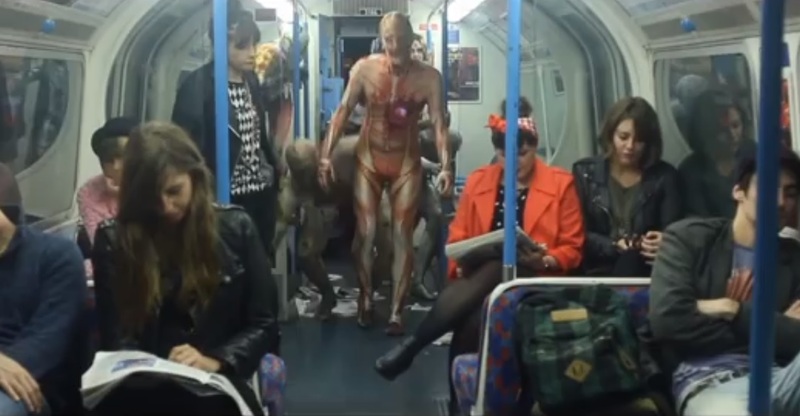 I’d never heard of it either until I saw this YouTube Video in which passengers on the London Underground became victim to all manner of Spandex clad monsters and their evil-looking friends (the fright mob). But don’t worry it was all good fun, nobody was hurt and if anyone soiled their pants they kept a diplomatic silence about it, took the prank in the manner intended, and skulled off to the nearest restroom. Unfortunately for some though, even the restroom is not always a safe refuge from the fright mob, as these members of a gym in Richmond discovered when they found something nasty lurking in the cubicles . . . The activities of the fright mob were not restricted to the restrooms though. Many other gym members also found their hearts racing for all the wrong reasons, and several joggers vacated their treadmills and ran in the opposite direction when a crazy clown decided to share their cardiovascular workout and jumped on a neighbouring machine. It’s pretty funny. Check out the video below . . . The fright mob attacks were organised by the Edinburgh based costume company Morphsuits, who began marketing their distinctive range of costumes back in 2009. The original morphsuit is a distinctive skin-tight body suit made from a mix of spandex and polyester, and the company have expanded their range to include over 100 different designs, not all of them quite so body hugging. These days the range also includes zombies and crazy dead-on-their-feet surgeons with gruesome-looking holes in their chest. Needless to say, many of these costumes are a perfect choice for anyone wishing to get with the Halloween spirit and adopt a scary new look. In a matter of just a few years the company has become a force to be reckoned with in the costume industry, but, above all else, Morphsuits is a fun company, so it probably is not that surprising that they came up with the fright mob idea. The company has a very active social media presence and this year, in the run up to Halloween, the company has been encouraging their twitter followers to nominate their friends for a fright mob attack. They have already received several hundred requests, so be warned, nobody is safe, your name may be on the list, and it’s no good running because, if it is, the fright mob will find you.